In May 1945, when Germany surrendered to the Allied Powers, the Galicia Division was based in Austria. Retreating westwards to avoid capture by the advancing Soviet Red Army, most of its members (about 10,000) surrendered to the British Army and were temporarily interned near Spittal. The Soviet authorities claimed that the Ukrainian members of the division were Soviet citizens and demanded their repatriation to the USSR on the basis of an agreement reached at the Yalta Conference in February 1945. The British government’s position, however, was that the agreement only applied to persons who were Soviet citizens before September 1939, and therefore did not apply to the majority of the division's members, who were originally from pre-war Polish-ruled Galicia. Only the relatively small number of those who came from the pre-war USSR were subject to the agreement, but even in these cases the British government was reluctant to enforce repatriation. In May and at the beginning of June 1945 the division was transferred to Italy and interned in a camp near Bellaria on the Italian east coast. There, about 1,000 division members were persuaded by a Soviet repatriation commission to return to the Soviet Union voluntarily. In October 1945 the remaining members of the division were moved to a camp near Rimini, a short distance from Bellaria. From the end of 1945 the British government began to consider how to deal with the division’s members in the longer term. The matter became more urgent in February 1947 when the Allied Powers signed the Treaty of Peace with Italy, due to come into force in September of the same year. Britain did not wish to leave the division behind after removing its troops from Italy, fearing the Italian government might succumb to Soviet demands for the forced repatriation of the Ukrainians. On 1 April 1947 the British Cabinet took the decision to transfer the division to the UK. Whereas in Italy its members were designated surrendered enemy personnel, upon transfer to the UK they were reclassified as prisoners of war. During May and June of 1947, 8,570 Ukrainians were transported by sea from Venice to Britain. The group included 17 female nurses, a number of priests and several civilian relatives of members of the division. The ex-soldiers were accommodated in prisoner-of-war camps, mainly in eastern England and southern Scotland. Most were engaged to work as agricultural labourers, where they earned a reputation as conscientious workers. The transfer of the division to the UK was initially viewed by the British government as a temporary measure forced upon them by circumstances, rather than a long term solution, and discussions about the future of the ex-soldiers continued. The Home Office, in particular, sought opportunities for removing them from the UK. The possibility of transferring groups of the men to Canada, the USA and Argentina were investigated, but proved unrealistic at the time. In November 1947 the Ministry of Agriculture began to consider the possibility of including some of the ex-soldiers in the European Volunteer Workers (EVW) scheme, under which it was recruiting workers from displaced persons camps in Germany and Austria. At first, the ministry was prepared to take 4,700 of the ex-soldiers, while the remainder, including those in poor health or disabled, were to be transferred to the British Zone of Occupation of Germany. This led to protests by the Association of Ukrainians in Great Britain and a number of British charities. Eventually, as a result of the rising demand for additional labour, it was decided that almost all of the ex-members of the Galicia Division would be released from prisoner-of-war status and engaged to work under the EVW scheme. The process was carried out between August and October 1948. 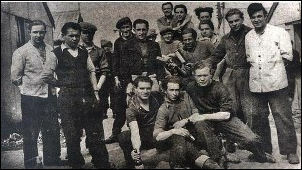 In December 1948 a decision was taken to deport to Germany at the end of the month about 300 ex-members of the division. In protest against the decision, a general strike of Ukrainian EVWs took place on 28 December 1948. Two days later the Home Office announced that only 81 persons were to leave: 45 who chose to go, mainly to rejoin relatives, and 36 with records of unsatisfactory behaviour as prisoners of war. As a result, over 8,000 former soldiers of the Galicia Division were allowed to remain in the UK as EVWs. Many of them subsequently emigrated to other countries. Photo: Former soldiers of the Galicia Division at the Hallmuir POW camp near Lockerbie, Scotland. 1948. The Galicia Division was a Ukrainian military formation within the German armed forces in the Second World War, created in Western Ukraine (specifically the Galicia District of the German-occupied Generalgouvernement) to fight on the Eastern front against Soviet forces. The formation was created as the 14th division of the “armed SS” (Waffen-SS), one of many Waffen-SS divisions composed of non-German volunteers and conscripts in various countries occupied by Germany. Its creation was announced on 28 April 1943 in Lviv, and had the support of Galician Ukrainian leaders who viewed the division as the potential nucleus of a future Ukrainian national army. Initially, the division consisted mainly of Ukrainians from Galicia, but subsequently it also took on recruits from other parts of Ukraine, including Soviet army personnel taken prisoner by the Germans. From July 1943 to June 1944 the recruits were trained in camps in Germany and other European countries occupied by Germany. In July 1944 the division, as part of the German 13th Army Corps, fought in a battle near Brody (about 100 km east of Lviv) against advancing Soviet forces. The corps was surrounded and destroyed. Of the 10,000-11,000 soldiers of the Galicia Division who took part in the battle, several thousand were killed or taken prisoner, some merged with the local population and others escaped the encirclement. A significant number of those who survived the battle joined the Ukrainian Insurgent Army, while about 3,000 returned to the division. After Brody, a new division was formed, comprising the soldiers who returned from the battle, an existing training and reserve regiment and new recruits. Training of this so-called “Second Division” began in Neuhammer (Świętoszów in present-day Poland). In October 1944 it was transferred to Slovakia, where the training continued, and where some units were deployed against Soviet and pro-Soviet partisans. In mid-January 1945 the division numbered 14,000 soldiers and 8,000 new recruits in the training and reserve regiment. At the end of January and beginning of February the division was relocated to Slovenia where, together with German units, it fought against Tito’s communist partisans. In early April it was moved to the eastern front in Austria, where it successfully fought back against Soviet forces which had broken through the front line between Feldbach and Gleichenberg. In March 1945 the Germans announced the creation of a Ukrainian National Army (UNA), which was to incorporate the Galicia Division. On 25 April the soldiers of the division swore an oath of allegiance to the Ukrainian people before the UNA commander, General Pavlo Shandruk. The division thereby officially ceased to be part of the Waffen-SS and became the 1st Ukrainian Division of the UNA. In the final weeks of the war, however, with the organisation of the UNA still in its early stages, the division remained under German operational control. At the beginnning of May 1945, when Germany’s capitulation was immiment, it was decided that, to avoid capture by Soviet forces, the division should surrender to the British 8th Army, which had already entered Austria. Representatives of the division were sent to make contact with the British, and arrangements for the surrender were agreed. On 8 May, a few hours before the German surrender to the USSR, the division was ordered to retreat from the front. Most of its personnel (about 10,000 men) surrendered to the British and were interned in Italy before being subsequently transferred to the UK. About 1,000 members of the division crossed into Southern Germany, surrendered to US forces, and were interned in US camps in Germany and Austria. Image: Insignia of the Galicia Division.